More advanced centrifuges coming? A secret site? The Natanz Fuel Enrichment Plant (FEP) has now operated for over two years with several thousand IR-1 centrifuges. Iran has enough centrifuges to produce a significant quantity of weapon-grade uranium, if it decided to do so. Yet, it is far from being able to produce enough enriched uranium for a nuclear power reactor. It is natural to ask how well the IR-1 centrifuges are operating and to chart their performance. But assessing what Iran has achieved at the FEP remains difficult because Iran reveals little centrifuge performance information to the International Atomic Energy Agency (IAEA), and the IAEA in turn reveals even less publicly in either its safeguards reports or during interviews. Complicating any assessment, the public information has often been ambiguous or subject to subsequent revision. 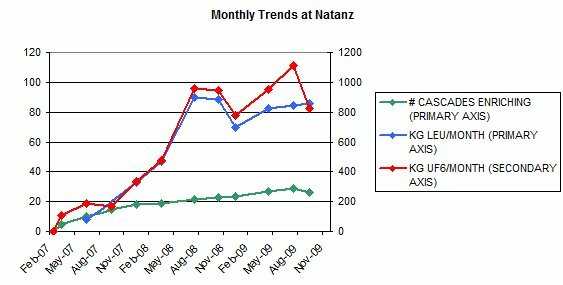 Thus, the data contained in IAEA reports are not sufficient alone to answer many questions about Natanz’s progress. For example, every three months in its safeguards reports, the IAEA reveals the number of IR-1 centrifuges operating with uranium hexafluoride (UF6) on a given day.The inspectors do not however verify whether that number of centrifuges is actually producing low enriched uranium (LEU), or whether they receive enough information from Iran to determine the average number of centrifuges enriching during any extended period. The absence of such information, which would incorporate data about breakdowns and maintenance, complicates any comparison of the FEP’s production of low enriched uranium to expected LEU output. One useful measure of a plant’s enrichment output is to estimate the average enrichment output, or separative capacity, of an IR-1 centrifuge. But doing this requires knowing the number of centrifuges actually enriching, the very value that is unreliable. Similar problems confront other standard measures of enrichment performance. Nonetheless, a comparative analysis of the FEP’s performance is possible. It is useful to start by going back to the original purpose of the Natanz Fuel Enrichment Plant. In 2006 Iran said publicly that the FEP would eventually hold 48,000 IR-1 centrifuges and produce 2,500 kilograms of low enriched uranium per month, enough to fuel a large nuclear power reactor 1. Iran remains far from that goal, with 8,692 centrifuges installed as of November 2, 2009 but only 3,936 of these declared as enriching uranium on that day 2. As discussed in more detail below, Iran’s monthly rate of LEU production remains below 100 kilograms per month. With 18 percent of the planned centrifuges installed, Iran should be producing 450 kilograms of LEU per month. Counting only those centrifuges reported as enriching and ignoring the rest, Iran should be producing at a rate of 200 kilograms of LEU per month. The problems at the FEP, particularly during the last year, appear to involve complications in deploying thousands of reliable centrifuges. But despite these problems, it is important to remember that a centrifuge program is not unchanging or static; centrifuge development is intrinsically about improving the separative capacity of the centrifuges. Iran will continue to improve its enrichment performance at Natanz and elsewhere. It is certainly capable of achieving greater output from the IR-1 centrifuges. In addition, the IR-1 centrifuges are operating well enough to produce significant amounts of enriched uranium–enough for a nuclear weapon–if Iran is prepared to take account of a high centrifuge attrition or breakage rate by taking more time. Iran could also compensate for the IR-1 centrifuge’s poor performance by simply using more machines to enrich uranium. Overall, the time Iran would need to produce weapon-grade uranium, if it decided to do so, either through break-out or starting with natural uranium at Natanz, does not appear to have shifted significantly from earlier ISIS estimates, although Iran would need to use more centrifuges than assumed in these earlier estimates if at the time of breakout the centrifuge cascades were not performing better. Moreover, Iran is already claiming one benefit of operating centrifuges, which is an achievement relatively few nations can boast. For now, according to one European intelligence agency that ISIS queried, Iran appears content to demonstrate to the world that it can enrich, disregarding how well or poorly its centrifuges operate. 3. More advanced centrifuges coming? A secret site? Iran is developing more advanced centrifuges, for example the IR-2 modified, IR-3, and IR-4 centrifuges, which should exhibit better performance and reliability than the IR-1 centrifuges 3. Iran is likely to try to deploy these more advanced centrifuges as quickly as possible, particularly at the Fordow enrichment site, near the city of Qom. To do so, however, Iran must manufacture thousands of these centrifuges. Its success will depend on whether it has imported, often via smuggling, adequate stocks of materials and equipment. Iran may also have other enrichment plants that house P1 centrifuges or advanced centrifuges. The recent discovery of the Fordow site reinforces that possibility. Perhaps, those centrifuges operate better at these undiscovered sites than at the Natanz site. But Iran’s problems in getting its centrifuges to work at Natanz appear genuine. In addition, the construction of centrifuge plants requires significant resources related to centrifuge component manufacturing and assembly. Thus, it appears likely that Iran would have a difficult time successfully completing a secret centrifuge facility elsewhere while simultaneously working on the Natanz and Fordow enrichment plants. But it is still possible that Iran could be building one now, while deploying centrifuges at the Natanz and Fordow plants. During 2010, Iran may not have a significant enrichment capability, beyond the Natanz fuel enrichment plant, available for breakout using its existing stock of LEU or as a parallel effort starting with natural uranium. Iranian officials have steadfastly maintained that Natanz operates successfully and do not admit to any serious problems at the plant. However, the relatively low LEU output suggests otherwise. Iran tries to focus on the positive; its officials periodically trumpet the growth in the number of centrifuges installed at the plant. 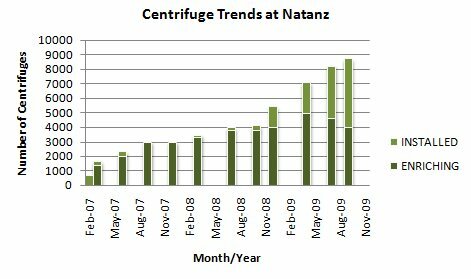 Figure 1 shows the steady increase in the number of installed IR-1 centrifuges, starting in February 2007. 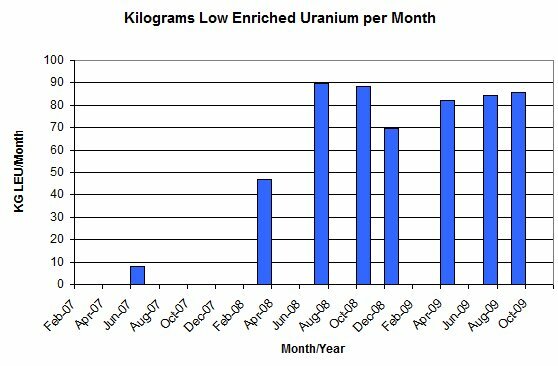 It also charts an increase in the number of IR-1 centrifuges stated to be enriching uranium until June 2009, when the number started to decrease. Iran has given no explanation for this significant decrease, although it reportedly said in August 2009 that it shut down a few cascades for maintenance 4. According to a senior official close to the IAEA, the IAEA does not know the reason for the decrease. Iran did acknowledge some technical problems in its centrifuges to the IAEA, but it did not volunteer why it reduced the numbers said to be enriching 5. Further confusing the situation, Iran’s current head of the Atomic Energy Organization of Iran (AEOI), Ali Akbar Salehi, stated in December 2009 that Iran is enriching in 6,000 centrifuges without any explanation 6. The IAEA has not publicly confirmed this number as of early February 2010. The IR-1 centrifuge is commonly called the P1 centrifuge, for Pakistan-1, since it is a design that Iran acquired in the 1980’s and 1990’s from the A.Q. Khan network. Khan had acquired this design illegally from the Dutch gas centrifuge program in the 1970s and built them in large numbers in the 1980s at the Kahuta enrichment plant in Pakistan. Additionally, Iran is developing more advanced centrifuges based on a P2 design that Khan also illegally acquired in the Netherlands, deployed in large numbers in Pakistan, and subsequently passed to Iran in the 1990s. Iran would be expected to face many challenges in successfully operating the Natanz fuel enrichment plant. Iran appears to have overcome the first challenge to successfully operate single P1 centrifuges or small P1 centrifuge cascades. Iran has said that it accomplished this goal during a pilot stage of its enrichment program at the Kalaye Electric Plant and the Natanz Pilot Fuel Enrichment Plant. Another challenge is to build and operate many centrifuges simultaneously, which is the current phase of Iran’s program. It is in this phase where Iran appears to be encountering problems. Based on Pakistan and Libya’s experience, the P1 centrifuge is known to cause problems in developing countries trying to duplicate it, even with extensive expert foreign assistance. For example, the P1 centrifuge experiences excessive vibration problems that can interfere with its operation, force its shutdown, or even cause it to break. When the Dutch operated the P1-type centrifuge in the Urenco plant in the Netherlands in the 1970s, their centrifuges experienced higher failure rates than the centrifuges developed by their chief competitor, Germany. This was one of the reasons why Urenco stopped using the Dutch designs and went ahead with the deployment of German centrifuges, such as those based on the G2. Khan appreciated the value of the G2, and he stole this design as well and renamed it the P2 centrifuge. Realizing the P1’s weaknesses, he tried to deploy this centrifuge as quickly as possible to replace his own P1 centrifuges. Iran appears to have inherited the operational problems in the P1 centrifuge. To make matters worse, Iran cannot appeal to the Khan network for help. The Khan network was stopped in 2004, making it impossible for Iran to draw upon Pakistani centrifuge experts for technical advice as it did in the 1990s and possibly the early 2000s. But Iran may be seeking aid elsewhere. Before evaluating the performance of the Fuel Enrichment Plant, it is important to look more closely at the P1 centrifuge. Iran has publicly released few details of its P1 centrifuge. From IAEA reporting, we know that the P1 is made out of four aluminum tubes connected by three maraging steel bellows, and a rotor assembly with a diameter of 100 millimeters. In 2006, a senior Iranian nuclear official stated that the P1 is 1.8 meters long and its rotor has a peripheral speed of 350 meters per second 7. IAEA and western intelligence agencies report a lower peripheral speed. A senior official close to the IAEA said in 2008 that the speed was only about 330 meters per second. A knowledgeable intelligence official in 2007 quoted a value of about 335 meters per second and said that Iran was operating the P1 centrifuge at this lower speed to prevent its centrifuges from crashing. As will be shown below, the lower value may be consistent with other statements by the head of Iran’s AEOI, despite his comment above about the speed being 350 meters per second 8. Neither the IAEA nor Iran has released detailed design information about the P1 centrifuge. Nonetheless, a method for modeling the enrichment performance of the P1 centrifuge is based on publicly available information about a precursor of the P1 centrifuge. In the 1960s, Gernot Zippe built the SSZ 100 9, a duplicate of a centrifuge that he, along with Russians and other Germans, developed in Russia after World War II. 10 This centrifuge had a rotor made out of aluminum with a diameter of 100 millimeters, a length of 48 cm, and a rotational speed of 360 meters per second. 11 The length of the rotor involved in enriching uranium, called its separative length, was shorter, or 43.1 centimeters. where Zeff is the separative length of the rotor, ∆M is the difference in the molecular weights of the uranium isotopes uranium 235 and uranium 238, v is the peripheral velocity of the centrifuge, R is the gas constant, and T is the temperature in Kelvin. Dρ is the product of D, the diffusion constant, and ρ, the total molar concentration. At peripheral speeds achieved by aluminum rotors, the separative capacity increases with the fourth power of the velocity, but at higher speeds, the separative capacity increases more slowly than the fourth power of the velocity. The P1 can be represented as four stacked SSZ 100s, where the separative length would be 172 centimeters. The total length of four SSZ 100s is too long, namely 192 centimeters, but almost 20 centimeters of this total length are not enriching, being above or below the enrichment zone of the centrifuge. In the case of the P1 representation, which is taken as 180 centimeters long, the remaining eight centimeters are treated as sufficient to define the non-separation zone and include the extra length required for the bellows. In any case, enrichment output, or separative capacity, increases linearly with length and can be adjusted easily if this length is too long. The total error caused by this imprecision in the length should be relatively small. Under these assumptions, an estimate of the P1 centrifuge’s maximum possible separative capacity is 7.52 kg U swu/year and the theoretical achievable maximum separative capacity is about 3.0 to 3.76 kg U swu/year. According to a former Urenco centrifuge expert, the maximum achievable separative capacity of the P1 is closer to 3.0 kg U swu/year. 18 Using Zippe’s 30 percent efficiency, an achievable value is about 2.26 kg U swu/year. Because the separative capacity of the P1 varies by the fourth power of peripheral velocity, a relatively small decrease in speed can translate into a significant decrease in separative output. If the speed were 330 meters per second, as said by IAEA and western intelligence, the separative capacity of a P1 centrifuge would decrease by 30 percent to 1.6 kg swu per year. Similarly, a speed of 350 meters per second would result in an estimated separative capacity of 2.03 kg U swu per year. Houston Wood, a U.S. centrifuge expert at the University of Virginia, has performed a theoretical assessment of the P1 centrifuge, using a sophisticated model of centrifuge output. 20 He assumed a separative length of 1.8 meters and a peripheral speed of 350 meters per second. He used the “pancake” code, so named because the uranium hexafluoride gas is smashed against the rapidly spinning wall like a pancake, and this model is more accurate than many other theoretical models of the complex behavior of the gas inside a centrifuge. This model, which optimizes the centrifuge’s separative capacity, estimates 2.02 kg U swu per year, close to the estimate based on the SSZ 100 at this speed. It is difficult to interpret Aghazadeh’s statements. For example, how to assess the wide variation in the separative capacities in the two cases, e.g. 0.92 kg U swu per year vs. 1.54 kg U swu per year (where both are uranium hexafluoride mass). Both are below values achieved in Pakistan and Europe. But the Iranian value of 1.54 kg U swu per year is consistent with the rotor having a peripheral speed of only 330 meters per second. The difference in these two values may reflect Aghazadeh’s view that the first one represents Iran’s initial expected achievement at the Natanz pilot plant and the second one includes later expected optimization of the P1 centrifuge, after Iran has accumulated additional operational experience. Such an interpretation could make sense for a centrifuge program with a slow moving, struggling development effort. Table 1 summarizes the various estimated separative capacities for the P1 centrifuge. Based on this analysis, an Iranian P1 centrifuge should be able to achieve 1.0-2.0 kg U swu per year. Without actual data on operation, as was the case until Aghazadeh’s interview in 2006, estimates of 2-3 kg U swu per year are high but reasonable in worst-case analyses. Because interpreting Aghazadeh’s information is difficult, these data are not sufficient to make definitive conclusions about the subsequent performance of Iran’s P1 centrifuge. In 2005, toward the end of suspension in Iran’s gas centrifuge program, senior officials close to the IAEA believed that Iran would need to do considerable work to get cascades to work. 1 Few anticipated the level of problems Iran would experience. Some of Iran’s own decisions appear to have worsened the FEP’s performance. In early 2007, Iran started bringing into operation cascades in the Natanz fuel enrichment plant. The FEP has two large cascade halls, called production halls A and B. Hall A is slated to hold 8 modules, units A21 to A28, each module containing 18 cascades, where a cascade contains 164 P1 centrifuges, for a total of 23,616 P1 centrifuges. Each module has its own feed and withdrawal systems. Information about Hall B is unavailable. Iran has never publicly revealed its schedule for installing all these centrifuges. By early November 2007, Iran had finished installing all 18 cascades in the first module (A24) and declared that it was enriching uranium in all of them. Figure 1 charts the growth in the number of centrifuges at the FEP. Iran has also installed cascades in the A26 and A28 modules. The decrease in the number of cascades said to be enriching has taken place in the A26 module, which reached twelve cascades enriching in June 2009 and decreased to six cascades enriching by November 2009. Iran is also working on preparing modules A25 and A27 for installation of centrifuges. Figure 2 shows Iran’s LEU production, plotted in increments of monthly average production. These values are derived from total LEU production during individual reporting periods that are detailed in IAEA quarterly safeguards reports. The data in these reports are not always consistent and include subsequent revisions. 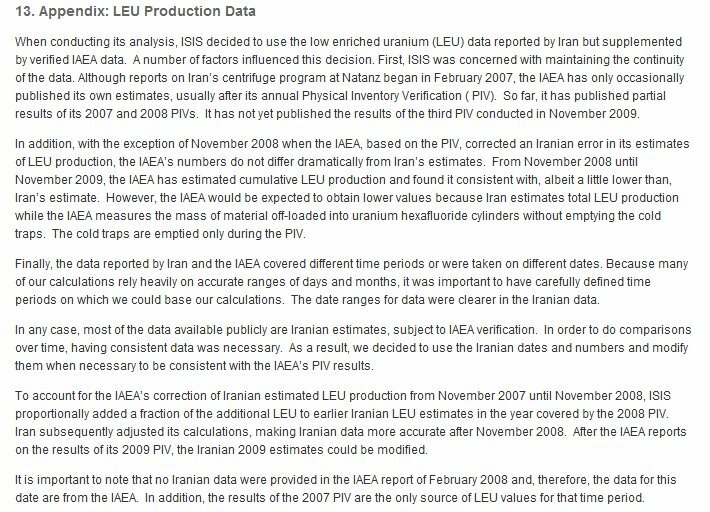 The data presented here are based on Iranian estimates supplemented by verified or corrected IAEA safeguards measurements, taken during the IAEA’s annual Physical Inventory Verification (PIV) at the FEP. These data are explained in more detail in the appendix. In addition, these data do not include the slightly enriched uranium in the dump tanks, which hold natural or slightly enriched uranium that is evacuated from cascades during unplanned centrifuge interruptions or breakage. If this natural or slightly enriched material were purged into the product tank, it would dilute the product, which Iran wants to be at least 3.5 percent enriched. Sometime in late 2008 or early 2009, the LEU rate declined significantly to about 70 kilograms per month. Afterwards, it rose slowly. By November 2009, the LEU rate had increased to about 85 kilograms per month but with more cascades stated to be enriching than in 2008. The reason for this decline in 2008 is unknown. That a problem is likely to have occurred is supported by the simultaneous increase in the number of centrifuges stated to be enriching. One explanation for the decrease in the rate of LEU production is that Iran experienced unexpected difficulties as it tried to scale up significantly its operations in the fall of 2008. The problems may not have been confined to only the A26 module where the number of cascades was increasing rapidly. In November 2008, a senior official close to the IAEA said that the feed rate in the A24 module was remarkably lower than the design value, but he did not know the reason why. 30 But, as will be discussed later, a range of other difficulties may have also developed, ranging from sabotage to a variety of challenges associated with operating large number of centrifuges. 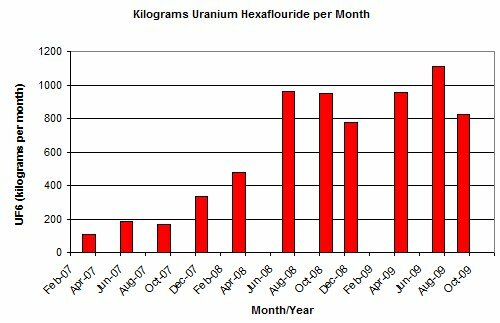 Figure 3 plots the average monthly rate of introducing natural uranium hexafluoride into the centrifuge cascades. Again, there is a drop in late 2008. Figure 4 compares the three sets of data. It plots both the average monthly feed rate and LEU product rate, along with a mid-point of the number of enriching cascades in each reporting period. The feed and LEU rates tend to go in tandem, as would be expected. The drop in both the feed and LEU rate in late 2008 is clearly visible, as is a slow increase in monthly LEU production afterwards. The figure also shows a sharp rise in feed after early 2009 and a steep decline afterwards. A senior official close to the IAEA said in November 2009 that the feed rate had been low for some time. The number of enriching cascades peaks with the feed values, which rise faster than the LEU values, suggesting that during 2009 a significant amount of the feed may not be ending up in the product tanks but instead in the dump tanks. The IAEA has not publicly released the amount of material it measured in the dump tanks during its physical inventory verifications. In recent safeguards reports it lists a combined amount in the tails and dump tank. 31 However, the IAEA has released the feed, product, and tails quantities measured in the 2008 PIV. Table 2 summarizes these values. As can be seen, the difference between feed and the product and tails is about 1,590 kilograms. It is known that natural, enriched, and depleted uranium is “held-up” in equipment in the module. In addition, natural uranium is in a uranium hexafluoride cleaning system at the front end of each module of cascades. But the total amount of uranium inside the module would be expected to total about 500-550 kilograms, based on the IAEA’s subsequent publications of this difference in its more recent safeguards reports. It is reasonable to assume that most of the rest of the 1,590 kilograms, or about 1,000 kilograms, was in dump tanks at the time of the 2008 PIV. This material was slightly enriched, according to a senior official close to the IAEA. Not all of it is recoverable, because at least some of the dump tanks also contain impurities deposited during the passivation process conducted before introducing uranium hexafluoride into cascades. The IAEA does not provide its estimates of the separative capacity of the FEP. A method to estimate these values is to start with the LEU product, where the slightly enriched uranium in the cascades’ dump tank is ignored. 34 To calculate the separative capacity, ISIS has used an enrichment level of 3.5 percent and a tails assay of 0.4 percent. These choices are consistent with the available data. Because the ratio of the feed to the product values in table 2 is about 10 to 1, after subtracting the 1,590 kilograms, the 2008 PIV suggests that the tails assay during this period was about 0.4 percent, where the product is taken as enriched to 3.5 percent. The IAEA’s environmental sampling conducted inside the FEP also supports these conclusions. The results of these calculations are in Figure 5 , which shows the annualized separative work achieved in the IAEA’s reporting periods, excluding the separative work needed to produce the slightly enriched uranium in the dump tanks. Separative work has been near 2,500 kg U swu per year from May 8, 2008 until November 2009, except for a drop to about 2,000 kg U swu per year in the period from early November 2008 until February 2009. Including the separative work in the dump tanks should not add more than about 10-20 percent to these estimates of the separative capacity. During the period May 2008 until November 2009, the number of centrifuges that Iran said were enriching started at 3,280, climbed to 4,920 and then decreased to 3936. During the period of the decrease in annualized separative work, early November 2008 until February 2009, 3,772 centrifuges were said to be enriching at the start of the period and 3,936 centrifuges were said to be enriching at the end of the period, an increase in the number of centrifuges while the separative capacity decreased. Thus, the amount of average separative work produced at the FEP is not related in a straightforward manner to the number of centrifuges Iran declares are operating on particular days. Calculating an average centrifuge output at the FEP is similarly difficult because of the lack of information about the average number of centrifuges actually enriching over a sustained period of time. With centrifuges broken in cascades and cascades not operating properly, any such estimate must be viewed cautiously, likely as an underestimate. 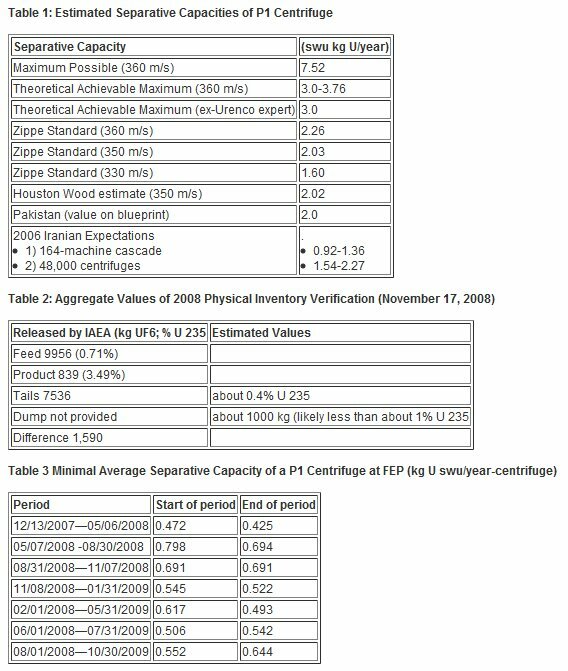 Despite the inherent problems in this type of estimate of average centrifuge separative capacity, for comparative purposes, Table 3 compares these values from 2007 until November 2009. The values depend on the number of centrifuges enriching at the beginning and end of each IAEA reporting period. Since the number of centrifuges enriching between these two dates is unknown, an average of these two values is not used. In fact, caution has to be exercised in interpolating an average separative capacity in between two endpoints; the actual value could follow a complicated pattern. But with this caution, the average separative capacities grew from slightly greater than 0.4 kg U swu per year to almost 0.8 kg U swu per year in late 2008 and then dropped to about 0.5 kg U swu per year. The value at the end of 2009 was about 0.64 kg U swu per year. However, as noted, these values could significantly underestimate the actual values or lead to inaccurate interpretations. Another indicator of performance, albeit cruder, is to compare the expected output from a reasonably-run plant of 4,000 P1 centrifuges to the FEP’s actual performance in enriching uranium. This number of centrifuges is a rough approximation of the number operating from May 2008 until late 2009. The expected separative capacity of the plant is calculated by multiplying this value of 4,000 centrifuges by an average separative capacity of a P1 centrifuge, which can be selected from Table 1, in this case 0.9-1.6 kg U swu per year, where the range captures three of the Iranian values in this table. Thus, Iran should have been able to achieve a total output of 3,600-6,400 kg U swu per year. As derived earlier, Iran has achieved approximately 2,500 kg U swu per year. One way to handle the uncertainty in the number of centrifuges enriching is to assign a capacity factor to the plant. This value would account for the number of centrifuges that are malfunctioning or are broken. Dividing the results, the capacity factor is 40 to 70 percent. At first glance, the range of capacity factors appears poor. However, based on Iranian technical and engineering capabilities, even the lower bound shows a significant accomplishment, given the difficulty of operating centrifuges. The performance of Natanz’s fuel enrichment plant is difficult to assess with the available information. Although the total separative capacity has remained near 2,500 kg U swu per year, the number of centrifuges installed or claimed to be enriching would suggest a larger separative capacity. A simple picture of the plant is one where cascades are subject to frequent malfunction, centrifuges break often and need to be replaced, and feed values fluctuate up and down in unpredictable ways. Even today, the FEP cannot be classified as a production plant; it remains a development facility, where Iran is struggling to learn to operate large numbers of cascades. Nonetheless, Iran continues to put enormous resources into its centrifuge program. There is no evidence of problems so severe that would prevent Iran from stockpiling more low enriched uranium or producing weapon-grade uranium, if Iran decided to do so. Iran has an established capacity at the FEP large enough to produce in theory about 15-16 kilograms of weapon-grade uranium a year, using tails assays of 0.4-.0.5 percent and starting with natural uranium. This is roughly enough to produce one nuclear weapon within a year and half to two years. By using more of the centrifuges at Natanz, it could shorten this time estimate by half. If Iran decided to use its sizeable stock of LEU as feed into its centrifuges, it could produce enough weapon-grade uranium for a nuclear weapon in less than six months. It is worthwhile to note that a choice of a tails assay of 0.5 percent, while it might appear high, reflects the experience of states seeking nuclear weapons, particularly in the early phases of their effort. For example, during the first six to seven years of operation of the first U.S. gaseous diffusion plant at Oak Ridge dedicated to the production of highly enriched uranium for weapons, the tails assay was about 0.5 percent. 35 Similarly, the Y Plant, South Africa’s source of highly enriched uranium for nuclear weapons, had a tails assay of 0.5 percent during its first several years of operation, at which point the tails assay was reduced to 0.4 percent during the remainder of the plant’s operation. 36 The reason for such a high tails assay is straightforward to understand; speed is of the essence. A larger tails assay leads to the production of more enriched uranium, and uranium is typically plentiful, at least to provide for a nuclear weapons program. In contrast, a commercial program, which requires much larger amounts of uranium, would be incentivized to seek a lower tails assay. It would consider a significantly lower tails assay as a result of a commercial optimization of the cost of uranium and separative work. Over the years, ISIS has discussed the performance of the FEP with numerous officials in the IAEA, the United States, Europe, Israel, and other countries. One common view is that Iran has moved too quickly to install centrifuges at the expense of developing competence in operating them reliably. In the process, it has made many mistakes. Based on IAEA reporting, as mentioned earlier, Iran was expected to have significant problems in learning to operate P1 cascades. The performance data show that Iran has experienced a painful learning curve. Recently, a European intelligence agency, in response to ISIS’s queries, stated that the FEP experiences a daily attrition of centrifuges through breakage. In addition, the centrifuges are only sporadically loaded with uranium hexafluoride, implying that the FEP should not be viewed as a plant experiencing continuous enrichment in a specified number of cascades. Rather, centrifuges and cascades continuously come and go out of operation. One senior western intelligence official told ISIS in October 2007 that Iran rushed to deploy centrifuges at the FEP, leading to mistakes that would eventually reduce centrifuge performance. In the spring of 2006, according to this official, Iranian political leaders and leading enrichment technical experts met to plan out the centrifuge effort at FEP. The scientists pledged to the political leaders that in a year they would reach a key benchmark at Natanz, suggested by this official to be the production of enriched uranium. After a year and half, however, FEP had still not met that benchmark, according to this official, placing the Iranian technical experts under tremendous pressure to succeed. This may help explain the rapid scale up in 2007 of the numbers of centrifuges at the FEP while the plant produced less then expected amounts of LEU. For a country such as Iran, facing sanctions, international scrutiny, exclusion from traditional suppliers and expertise, and possibly even an effort by foreign intelligence to sabotage the enrichment effort, there are many problems that complicate the building and operation of a centrifuge plant, any one of which could have degraded the performance of the centrifuges at the FEP. There could be recurrent problems in manufacturing or assembling P1 centrifuges. These problems may lead to centrifuges experiencing reduced enrichment output or even failing earlier than expected, in essence suffering a short operational lifetime. For several years, governmental and IAEA experts have suggested that Iran might have experienced problems in making certain components, such as the rotor. Older centrifuge components, many of which were made in the early 2000s, prior to the 2003 suspension of Iran’s enrichment program, could have been of lesser quality than newer parts. In addition, assembling centrifuges requires care, and mass assembly of centrifuges can lead to mistakes that can lower the enrichment output of the centrifuge. For example, the scoops must be precisely placed inside the rotor assembly of a centrifuge; a poor placement can significantly degrade its separative capacity. The FEP might experience problems in sustaining a correct temperature gradient along the side of each centrifuge; this temperature gradient is critical to maintaining the expected separative capacity of a centrifuge. The tubes spiraling along the outside of the P1’s outer casing carry water that regulates that temperature. Perhaps, the water pumping system has been subject to variation and unable to maintain reliably the correct temperature along the side of the centrifuge. As discussed earlier, another unsolved issue may be excessive vibration in the P1 centrifuge that causes breakage or requires centrifuges to be taken off-line. Iran might already be operating its centrifuges at a lower speed to reduce such operational instabilities, but perhaps even at reduced rotational speeds, it is still unable to control this problem. Iran might have on-going problems with the FEP’s elaborate computer system that monitors and controls the operation of the centrifuges. Iran has tried to compensate for its lack of experience by operating its centrifuge plants using computer control systems that automatically obtain data from a wide variety of equipment. 37 In contrast, Urenco designed and operated its early centrifuge plants, such as ones involving G2 centrifuges, without computerized control or much measuring equipment, relying instead on its long-term experience with centrifuges. Iran has instrumented its centrifuges to measure the pressure and temperature of the uranium hexafluoride gas, vibration of the rotor assembly, rotor speed, and the temperature of the cooling water. 38 This computer system controls all these measurements and any remedial actions, such as closing of valves to stop the flow of gas into an individual centrifuge experiencing excessive vibration. Malfunctions in this computer system would be expected in the early phase of its operation. Finally, there remains the question of what happened in late 2008 or early 2009 that resulted in a significant lowering of LEU output. Any of the above problems could have risen to a level that drastically cut LEU production. In addition, an unknown event could have caused the drop. A senior official close to the IAEA said in November 2008 that Iran had recently started to feed uranium hexafluoride that used uranium mined in Iran. 39 Iran has generally fed its cascades with uranium hexafluoride produced from yellowcake obtained from South Africa several decades ago. Impurities in the domestically produced uranium may have damaged the cascades. But Iran has enough uranium hexafluoride made from South African uranium that it would not need to use its domestically produced uranium for years. The New York Times has raised the possibility of sabotage. 40 Iran depends extensively on foreign, mostly illegal, procurements to outfit its gas centrifuge program. It seeks vacuum pumps, vacuum measurement equipment, electronic subcomponents, high strength aluminum, magnets, and a wide variety of other equipment. It is well known that the United States and European intelligence agencies have sought to place defective or bugged equipment into Iran’s smuggling networks. Perhaps, some of this defective equipment caused damage at Natanz. The problem may have been limited to module A26, which is the one that had the rise and fall in the number of enriching cascades. However, the available information is not sufficient to determine whether the drop in LEU production occurred in only one module. A challenge for Iran is to develop competency in operating centrifuges. By rushing installation and operation, Iran appears to have skipped a critical step in centrifuge development, namely operating a fixed number of cascades for an extended period. For example, the Soviet Union, the first state to deploy large numbers of centrifuges, built a plant with 2,000-3,500 centrifuges in 1957. It operated this plant for almost two years before deciding that a larger plant was technically feasible, at which point it accelerated its mass production of centrifuges. Iran appears to have embarked on simultaneous mass production and deployment of P1 centrifuges, before it proved its technical competency to operate them. Iran may have cut back enrichment operations in order to rectify its mistakes. Regardless of the technical difficulties, Iran has gained politically by rushing to install 8,700 P1 centrifuges. Iran may have placed a premium on rapidly installing more centrifuges at the FEP, establishing facts on the ground, in case the regime decided to negotiate a freeze in its enrichment program. How it manages to get all these centrifuges enriching bears close watching. The first estimate assumes that Fordow will have 4,000 centrifuges and operate no better than the FEP has until late 2009. In this case, the Fordow site could be compared to FEP, which achieved about 2,500 kg U swu per year, capable of making 15-16 kilograms of weapon-grade uranium per year, starting with natural uranium. At this rate, Fordow could produce enough weapon-grade uranium for one nuclear weapon in a year or two, where a nuclear weapon is estimated to require from about 16 to 30 kilograms of weapon-grade uranium. The weapon itself would require 15-25 kilograms of weapon-grade uranium and the rest represents losses during manufacture of the weapon components. This range includes crude fission designs that require about 15-20 kilograms of weapon-grade uranium, and the Chinese warhead design A.Q. Khan gave Libya, and perhaps Iran, that utilizes almost 25 kilogram of weapon-grade uranium. But it is likely that Iran will improve the performance of the P1 centrifuges. And it would be expected that P1 centrifuge performance would increase again by the time Iran would expect to operate the Fordow facility. The greater number of centrifuges per cascade at the Fordow site may reflect a decision by Iran to better ensure that the amount of LEU product and its enrichment level is maintained at expected levels, while at any point a certain number of centrifuges in each cascade may not operate properly. Another way to estimate Fordow’s output is to perform multiple calculations of the time needed to produce enough weapon-grade uranium for a bomb, resulting in a frequency distribution of estimates. In this calculation, ranges of variables are derived based on current operation at the FEP and the above range of weapon-grade uranium needed to make a nuclear weapon. In addition, this method provides an estimate of the amount of weapon-grade uranium Fordow could produce. The amount of weapon-grade uranium per weapon is taken as 16.5-30 kilograms, where the range used in 15-25 kilograms per weapon with the remainder representing losses in manufacturing the weapon. These calculations are performed using Crystal Ball software, which performs Monte Carlo calculations using the above ranges, where each value in a range is assumed equally likely. 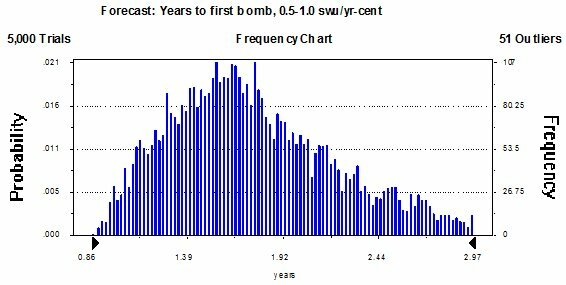 Figure 6 is the frequency distribution of the values for the time required for the Fordow plant to produce enough weapon-grade uranium for one nuclear weapon in the case where 3,000 P1 centrifuges operate. The median is 1.7 years; and the 5th percentile is 1.1 years and the 95th percentile is 2.7 years. Including 90 percent of the values eliminates extreme values that occur infrequently. It should be noted that these estimates do not include the extra time to fashion a nuclear weapon. In terms of weapon-grade uranium production, the distribution has a median of 14 kilograms of weapon-grade uranium, where the 5th percentile is 9.7 kilograms of weapon-grade uranium and the 95th percentile is 18 kilograms. Figure 7 is the frequency distribution of the values for the time required for the Fordow plant to produce enough weapon-grade uranium for one nuclear weapon in the case where 4,000 P1 centrifuges operate. The median is 1.25 years. The 5th percentile is 0.8 years, and the 95th percentile is 2.0 years. In terms of weapon-grade uranium production, the distribution has a median of 19 kilograms of weapon-grade uranium, where the 5th percentile is 12.9 kilograms of weapon-grade uranium and the 95th percentile is 24 kilograms. Improved operation of the P1 centrifuge would of course shorten the time necessary to make a nuclear weapon. If at the Fordow plant the average separative capacity reaches 1.0-1.5 kg U swu per year, more in line with Iranian expectations in 2006, the time to make enough weapon-grade uranium for a nuclear weapon drops to a median of one year, with the 5th percentile at 0.7 years and the 95th percentile at 1.4 years. Based on other developing countries’ centrifuge programs, such improvements are likely. Overall, the results support the Obama Administration’s finding that Fordow is large enough to produce enriched uranium for a weapons program, if Iran opts to configure it for making weapon-grade uranium. Its estimate that it would take Iran about one year to produce enough for a weapon would appear high based on a simple extrapolation of current performance of the Natanz fuel enrichment plant, i.e. 1 vs. 1.7 years. However, it is reasonable to expect that Iran would improve the performance of the centrifuges or increase their numbers at Fordow, resulting in a production timeframe in line with the administration’s estimate. If Iran uses LEU as feed in the Fordow plant, the time to produce its first nuclear weapon would shorten significantly. If the Natanz enrichment site makes 20 percent enriched uranium, and this material is used as feed in the Fordow plant or elsewhere, the time to make enough weapon-grade uranium for a weapon would shorten even more dramatically. In addition, far fewer P1 centrifuges would be necessary, allowing for a smaller facility. Iran is likely to concentrate on increasing its LEU output at Natanz, improving operation of its centrifuges, and building the Fordow enrichment plant. Now that Fordow is discovered, it could be planning or building another secret enrichment site. Iran’s problems in its centrifuge program are greater than expected one year ago. How much this has slowed Iran’s ability to make weapon-grade uranium is difficult to determine. However, Iran has almost 9,000 centrifuges at Natanz and the ability to make many thousands more either at Natanz or elsewhere. Despite the problems demonstrated at the FEP, Iran is unlikely to face significant delays in making weapon-grade uranium at Natanz, if it decided to build nuclear weapons. Starting with natural uranium, Iran could likely still produce enough weapon-grade uranium for a nuclear weapon in a year; it could do so considerably faster if it started with its stock of already produced low enriched uranium. But in 2010 Iran may be limited in its ability to produce weapon-grade uranium outside of the Natanz site, either in a breakout mode using its existing stock of LEU or in a parallel effort in a secret site starting with natural uranium. In the end, Iran can solve its centrifuge problems with time, either by improving the output of the P1 centrifuge or building more of them, or both. In the medium term, it can also deploy more advanced centrifuges. Given its announced plans to build ten more enrichment plants without notifying the IAEA about their location or status until six months before it introduces nuclear material, Iran’s capability to make weapon-grade uranium either in a secret parallel program or in a breakout is likely to grow with time. Iran’s progress at the FEP bears special watching to determine if Iranian technicians can overcome the plant’s problems and operate the centrifuges better. Because of the importance of this issue to the international community, the IAEA should release more data about the FEP’s operation. Iran is expected to continue seeking equipment, materials, and technology abroad for its centrifuge effort. Disrupting these efforts through increased vigilance on stopping illicit trade of dual-use materials and components can delay its centrifuge program and prevent the transfer of knowledge that could help Iran solve its problems in building and deploying not only the IR-1 centrifuge but more advanced ones as well. One can also expect more efforts by western intelligence services to place defective equipment in Iran’s centrifuge program. Given that Iran acquires much of this equipment illegally, such efforts are hard to condemn. However, predicting the impact of such efforts is impossible. The best way to constrain Iran’s enrichment program remains negotiations aimed at achieving a suspension of its program. Iran is unlikely to deploy enough gas centrifuges to make enriched uranium for commercial nuclear power reactors for a long time, if ever, particularly if sanctions remain in force. As such, one of the most striking lessons of reviewing Iran’s accomplishments at Natanz is just how unachievable a commercial enrichment program remains while how little is required to create a nuclear weapons capability. While Iran may take longer than expected to make sufficient weapon-grade uranium for a bomb, few believe it will fail in that effort. 1 Interview with Gholamreza Aghazadeh, then head of Atomic Energy Organization of Iran, “Iran’s Nuclear Chief Explains Nuclear Fuel Cycle, Comments on U.S. Concerns,” Network 2, April 12, 2006, translated from Persian. Here, the mass is assumed to be LEU hexafluoride (see later for a more thorough discussion of this assumption. 2 IAEA Director General, Implementation of the NPT Safeguards Agreement and relevant provisions of Security Council resolutions 1737 (2006), 1747 (2007), 1803 (2008) and 1835 (2008) in the Islamic Republic of Iran, GOV/2009/74, November 16, 2009. 3 Ibid. 4 David Albright, Paul Brannan and Jacqueline Shire, “Natanz Enrichment Plant: How to Measure Progress,” September 1, 2009, http://isis-online.org/uploads/isis-reports/documents/Natanz_Centrifuge_Progress_1Sept2009.pdf. 5 Interview with senior official close to the IAEA, August 28, 2009. 6 Ali Akbar Dareini, “Iran Making New Model Centrifuges for Nuke Program,” Associated Press, December 18, 2009. 7 Interview with Gholamreza Aghazadeh, op. cit. 8 Interview with senior official close to the IAEA, May 28, 2008. 9 Zippe said that SSZ stood for both self-stabilizing centrifuge or for Steinbeck, Schefffel, and Zippe, the three principal German or Austrian developers of this centrifuge in Russia after World War II, interview, September 22, 1993. 10 Erwin Coester and Gernot Zippe, “Zur Berechnung von Idealen Zentrifugenkaskaden,” GKT, Julich, KFA Monographien B25979, February 11, 1968; and Albright, Frans Berkhout, and William Walker, Plutonium and Highly Enriched Uranium 1996: World Inventories, Capabilities and Policies (London: Oxford University Press, 1997). 11 A maximum speed of 400 meters per second is possible with aluminum rotors, but at speeds much above 360 meters per second, aluminum creeps reducing drastically the lifetime of the centrifuge. 12Coester and Zippe, op. cit. ; and R.L. Hoglund, J. Shacter, and E. Von Halle, “Diffusion Separation Methods,” in Kirk-Othmer, Encyclopedia of Chemical Technology, volume 7, third edition, 1979. 13 Coester and Zippe, op. cit. 14 Ibid. 15 Ibid. 16 Ibid. 16 Ibid. ; the temperature was 303 Kelvin or 30° centigrade. 17 Interview with Zippe, September 22, 1993. 18 Interview with former Urenco expert, 2005. 19Interview with a senior official close to the IAEA, 2004. 20 Houston Wood, “Analysis of the Proposed Gas Centrifuge Plant at Natanz,” Proceedings of the 48th Annual Meeting of the Institute of Nuclear Materials Management (2007). 21 Iranian television interview with Gholamreza Aghazadeh, op. cit. 22 See for example, http://www.wise-uranium.org/nfcue.html. 23 IAEA Director General, Implementation of the NPT Safeguards Agreement in the Islamic Republic of Iran, GOV/2006/27, April 28, 2006. 24 http://www.wise-uranium.org/nfcue.html. 25 The capacity of the uranium conversion facility at Esfahan is 200 t of uranium in uranium hexafluoride per year or 300 tones of uranium hexafluoride per year. This capacity would suggest that Aqadazah was using uranium hexafluoride mass or expected the output of the uranium conversion facility to increase. 26 A 100 percent capacity factor is assumed for the plant. 27 A lower tails assay would conserve uranium resources. With a tails assay of 0.3 percent, and assuming that all the centrifuges are working as designed, an average centrifuge would produce 1.83 kg U swu per year in the case of the mass being uranium hexafluoride. 28 Interview with senior official close to the IAEA, January 12, 2005. 29 Briefing by senior official close to the IAEA, September 15, 2008. The feed rate was close to the 70 gram per hour per cascade stated by Aghazadeh in April 2006 as Iran’s goal. 30 Interview, November 19, 2008. 31 IAEA Director General, Implementation of the NPT Safeguards Agreement and relevant provisions of Security Council resolutions 1737 (2006), 1747 (2007), 1803 (2008) and 1835 (2008) in the Islamic Republic of Iran, GOV/2009/74, November 16, 2009; IAEA Director General, Implementation of the NPT Safeguards Agreement and relevant provisions of Security Council resolutions 1737 (2006), 1747 (2007), 1803 (2008) and 1835 (2008) in the Islamic Republic of Iran, GOV/2009/55, August 28, 2009. 32 Communication from the IAEA, February 2009. 33 Implementation of the NPT Safeguards Agreement and relevant provisions of Security Council resolutions 1737 (2006), 1747 (2007), 1803 (2008) and 1835 (2008) in the Islamic Republic of Iran, GOV/2009/74, November 16, 2009; IAEA Director General, Implementation of the NPT Safeguards Agreement and relevant provisions of Security Council resolutions 1737 (2006), 1747 (2007), 1803 (2008) and 1835 (2008) in the Islamic Republic of Iran, GOV/2009/55, August 28, 2009. 34 There is not enough information to include in the calculations the slightly enriched uranium in the dump tanks. 35 Frank von Hippel, David Albright, and Barbara G. Levi, “Quantities of Fissile Materials in U.S. and Soviet Nuclear Weapons Arsenals,” PU/CEES 168 (Princeton, New Jersey: Princeton University, Center for Energy and Environmental Studies, July1986), citing Thomas B. Cochran, William M. Arkin, Robert S. Norris, and Milton M. Hoenig, Nuclear Weapons Databook, Volume 11: The Production Complex (Cambridge, Massachusetts: Ballinger Publishing Company, 1987). 36 Y Plant operational logs, in graphical form. 37 Interview with senior European official, August 2009. 38 Interview with Aqazadah, op. cit. 39 Senior official close to the IAEA, November 19, 2008. 40 David E. Sanger and William J. Broad, “U.S. Sees an Opportunity to Press Iran on Nuclear Fuel, The New York Times, January 2, 2010. 41 IAEA Director General, Implementation of the NPT Safeguards, November 16, 2009, op. cit. 42 IAEA Director General, Implementation of the NPT Safeguards, November 16, 2009, op. cit. 43 “Iran Making New Model Centrifuge for Nuke Program,” op. cit. 44 Interview with senior official close to the IAEA, December 30, 2009. 45 Ibid. 46 The effect is negligible of using a range of 0.4-0.5%, instead of a fixed value of 0.5%.